A few years ago, a friend got me into jewelry making – beading, primarily using wire and often using glass/crystal, gemstones and metal beads. There are times when I think that bracelet she helped me make that first day was just the gateway to a far larger addiction, one that I thought culminated in my filling my own bead box (or BoB – Box of Beads). My BoB is the equivalent of a chunky rolly-carryon suitcase, and it’s filled to the gills with stuff. Even so, when a Groupon came into my inbox last year for a one-hour fused glass jewelry making class at a glass workshop not too far from my house, it seemed like a gimme. My sister agreed to come along and I bought the deal. Months later, after many months of saying “We need to use this thing before it expires!” and several emails from Groupon reminding me that this thing was sitting in my account unused, I went online to schedule. Since the workshop – Luke Adams Glass in Norwood, MA – uses the online Groupon schedule system, it was insanely easy to sign up for the class on their calendar. BIG PLUS. And then came the class itself. We were about 8 people, all newbies looking to make a new piece of shiny-shiny for ourselves. The instructor was quite friendly and showed us around – to the area where they blow the glass (hot!) and then into a side room that functions as a storeroom and class area. At a large high-top table, plastic bins of many colors of glass sat waiting for us, along with cutting and separating tools. 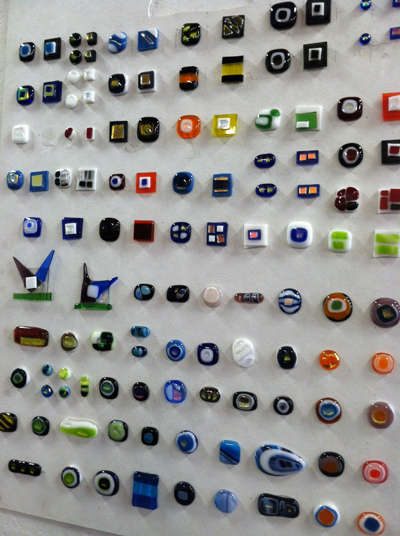 A board on the wall served to demonstrate how combinations and shapes change when the glass enters the kiln and gets fused. It becomes easy to see – although still incredibly hard to grasp – how square cuts turn to circles and yellows turn to reds and oranges. The class covered the making of a single piece: a pair of earrings, a pendant for a necklace, a ring, a focal point for a cuff bracelet or a bangle bracelet with 5 or 6 beads (depending upon required length). More pieces could be made for a nominal added cost (typically $20), and there was enough time in the hour to get instruction and make two pieces. For my part, I decided to throw in the extra $20 and make both a necklace and a six-bead bracelet. The necklaces automatically come with a silver-plated chain, and you can pay more for a sterling silver chain. You make the glass portion of the jewelry, and once it’s out of the kiln, the folks at Luke Adams take care of the gluing, mounting and other associated work required to turn the glass into something wearable. I have to say, one hour isn’t nearly enough. I could’ve stayed for 3 hours. 5 hours. It was a ton of fun trying to see what combinations I could come up with, and my fauxCD was nicely challenged by the need to make precise cuts and snap things just so in order to make sure that I didn’t turn the glass into something resembling poorly scooped Jell-O. (Which I also did, by the way.) It was so much fun that when I was on Groupon the other day, buying access to MOAR STARBUCKS (yeay! ), I saw a deal for a one-hour glassblowing class that yields you an ornament or paperweight. A quickly placed tweet to my sister and off I went, buying yet another hour of time at the studio. The shiniest pumpkin patch ever? For anyone else interested in checking out Luke Adams Glass – they have their own store at the workshop, and you can sign up for classes through Groupon or right there in the store. They seem to offer deals through Amazon Local Deals and Living Social, or you can pay full price right through their website or by signing up at the studio. Disclaimer: Neither Groupon nor Luke Adams Glass provided anything in exchange for this post; I wrote this on my own, under my own steam, and solely because I WANTED TO WRITE THIS TO SHOW MY SUPPORT OF A WICKED COOL LOCAL BUSINESS. The Groupon deal used to take this class was paid for 100% by me and my sister, without any additional offsetting by a third party. All opinions expressed above are my own. This entry was posted in locavore and tagged bracelet, crafting, fused glass, jewelry, jewelry making, necklace, pendant, ring by crunchymetromom. Bookmark the permalink.